I am not a fan of corned beef and cabbage, so it’s a bit of a travesty that I was allowed to trade my last name for an Irish one. I remember that my dear husband was able to overlook this flaw and try to make up for it every year with something special for St. Patrick’s Day. 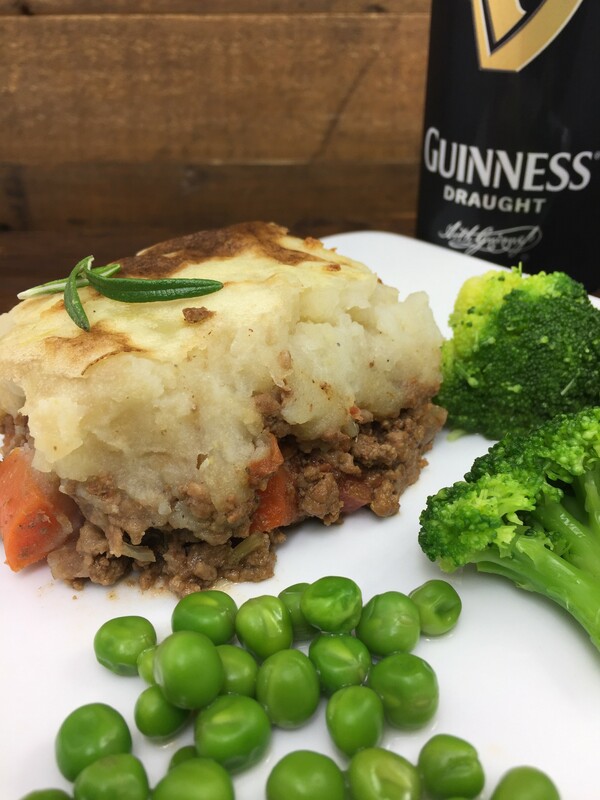 If you are looking for something beyond the usual corned beef and cabbage, it doesn’t get more Irish than a Shepherd’s Pie. Simple meat and potatoes comfort gets a little reinforcement from some Guinness, and you’ve got yourself a perfect meal for a little wearin’ o’ the green celebrating. 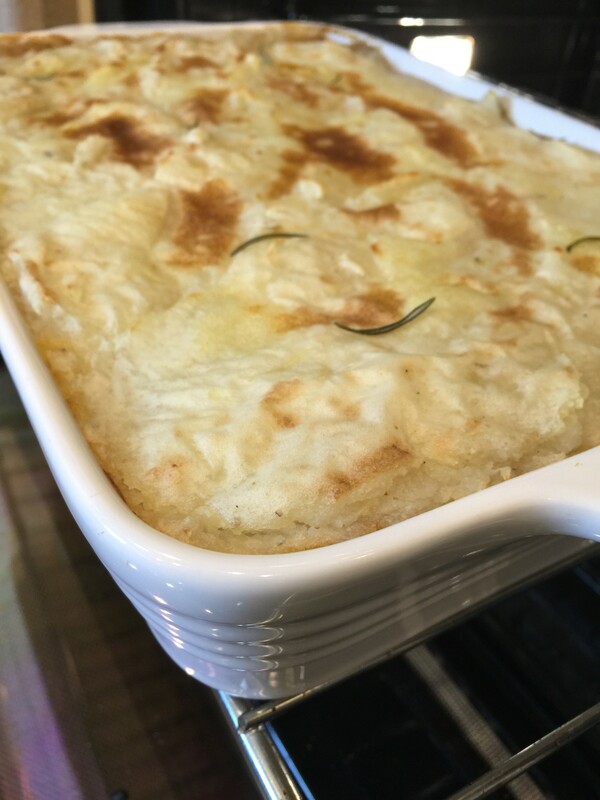 Shepherd’s pie is typically made with lamb. If you use beef, it is a “cottage” pie, but the two terms have been used interchangeably for a long time. Call it what you will, it is a crowd pleaser. The prep is very simple, and while it takes a bit more time, you can make it ahead. Also, the finished dish is so generous, you are guaranteed some hearty leftovers for several days. Make sure to use good quality ground meat. I used a mix of 7% and 15% organic ground beef, which lightened this up without compromising flavor. When I made the mashed potatoes, I added chicken base to the cooking water. This also adds a lot of flavor and lets you cut back on the butter. Pop the finished dish under the broiler for a few minutes at the end of the cooking time to get a nice, golden brown on the potatoes. Roughly chop the onions, carrots and celery. Peel and finely chop the garlic cloves. Strip the leaves off the rosemary and discard stalks. Warm a large Dutch oven over medium heat, adding a bit of olive oil. Add the onion, carrot, celery, garlic and most of the rosemary leaves. Cook for 8-10 minutes, stirring occasionally, until softened. Transfer vegetables to a bowl then add meat to pot. Turn the heat up and brown meat for about 10 minutes, stirring occasionally. Drain excess liquid from pan, return the vegetables, then add the Guinness. Continue to cook over medium-high heat, stirring often, until about half of the liquid has evaporated. Add diced tomatoes and beef stock, and season with a bit of salt and a generous grind of black pepper. Bring to a boil, then reduce heat to low and cover with a lid slightly ajar. Let simmer for 1 hour. Peel potatoes and cut into small chunks (about 1/2 – 3/4 inch) of equal size. Transfer to a pot of cold water and add about 1 tablespoon of salt, or chicken base, if using. Bring to a boil and cook for about 10 minutes, or until potatoes pierce easily with a fork. Drain well, then return to pot and add butter. Use a hand mixer to whip and mash the potatoes, adding the warmed milk a bit at a time, until potatoes are a creamy, thick mash. Season to taste with salt and pepper. Preheat oven to 375º F. Transfer the beef mixture to a large ovenproof baking dish. Spoon the mashed potatoes evenly over the top, covering to the edges. Scatter the remaining rosemary leaves over the top and drizzle with a little olive oil. Cook in preheated oven for 25 minutes, or until golden and bubbly. Serve with broccoli or peas.